The current emblem of the Republic of Macedonia is fully designed according to the emblem of the Soviet Union, according to which were designed the emblems of all Soviet republics, the ones of Yugoslavia and its republics, as well as other countries in the eastern bloc and other socialist countries such as Angola and North Korea. The required elements such as the sun, a five pointed star, wheat cereal bar associated with folk motifs symbolize “the dedicated society of communism” to which we would have come through the labor of the working class and farmers. By removing the red star off the emblem in 2009, the overall socialist look of the “Coat of Arms” was not changed, but only slightly amended. The biggest elements – the sun, a wheat cereal bar associated with folk motifs remained, thus fully defining the current arms as socialist. The image of a socialist country like Angola and North Korea do not match the Macedonian reality. Heraldic Coats of Arms are timeless symbols of cultural identification. They unite all communities and individuals in the state tradition. All European countries today possess heraldic coats of Arms. Even the countries of the former Eastern bloc, with the advent of democratic processes, reverted back to their historical coats of arms. Macedonia and Belarus are the last two European countries that still use the emblem represented with Soviet emblematics. On the other hand, Macedonia is one of the few countries in Europe that has a consistent symbol which unquestionably runs throughout its history, and which evidently connects the communities living in the country and are eligible for them. 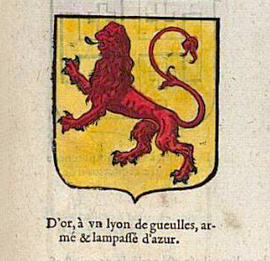 The proposal for a new Coat of Arms the Republic of Macedonia is based on the tradition of coats of arms related to Macedonia, ranging from the illustration of Willem Verland (+1481) and the Rolls of Jerome de Bara of 1581, which through the Stematography of Vitezovich (1694) and Zhefarovikj (1741) will become land arms of Macedonia. 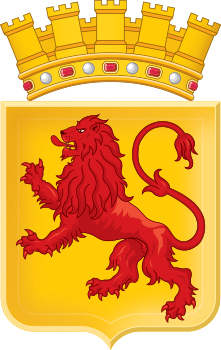 In European Armorials, the most consistent image is a red lion on a golden field. The most famous representation of it are given in the Rolls of Jerome de Bara (1581) and Jean Robin (1639), which preceded the Illyrian Armorials and come from European countries with developed heraldic tradition. 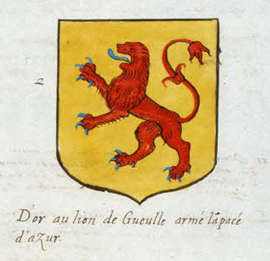 The blazon of the arms reads: Or, a Lion Rampant Gules. The shield is crowned with a golden-yellow mural crown with five towers, placed on a golden diadem adorned with rubies and pearls of Macedonia. The mural crown of the arms represents the republican organization of the country. The towers of the crown represent the graphic expression of the number five, which is a symbol of statehood. This aims to highlight and displays the sovereignty and integrity of the state. Rubies and pearls are symbols that are associated with the land as a natural soil. This proposal is consistent with the historical facts, and also responds to people’s perception of the times of national revival. The lion as a symbol can be unifying for all communities and citizens, as is proven in various European countries. The lion is undoubtedly a symbol of the Macedonians, Albanians and all other communities, which also represents a land symbol of the country, its territory and the state. This is why the red lion on a golden field is the best heraldic symbol that has its own tradition, as well as its present and future of a European Macedonia. With the adoption of this Coat of Arms, Macedonia will be included in the family of European countries as a country with European aspirations, who cares about its past and its future, promoting unity and tying itself to a symbol which represents no division on any basis in itself, but rather creates a unity of all who live in it.